We often test customers’ PCs to assess suitability for use inside our Industrial PC and Thin Client Enclosures. This line of enclosures allows a small PC or Thin Client to be placed in very rugged environments including full NEMA 4X/IP65/66 wash-down areas. At a customer’s request we’ve heat-tested two of the latest generation NUCs to see how they do. In both cases, we outfit the NUCs with 8 GB of RAM and Intel solid state drives. Following our usual process, we outfit the NUCs with thermal sensors on all of the internal heat-generating components. We then we run the NUCs on a bench top at 50-75% processor capacity and measure the temperatures of the internal components to set a baseline. 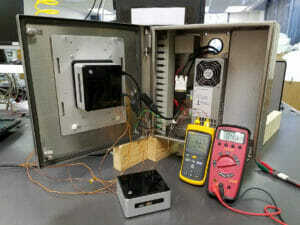 To determine heat rise inside our enclosure, we run the same test with the NUC inside one of our Small PC Enclosures powered by our integrated industrial power supplies. Once we determine how much hotter the internal components get when the NUC is placed inside our enclosure than they get with the NUC on the bench top, we can determine the maximum allowed ambient temperature that keeps the NUC internal components within the unit’s specification. The NUC6I5SYH is a latest generation i5-powered NUC. We found that this model showed a good trade-off of computing power vs. heat generation; in our tests it consumed 21 watts at ~75% processor utilization. At even lower power, the i3-powered NUC5I3MYHE used only 13 watts when running at ~75% processor utilization. Based on our tests, both of these models ran roughly 5°C hotter inside of our enclosure than when sitting in open air. Based on the NUC’s 50°C max ambient operating temperature, either of these could be installed into our Small PC Enclosure and run in 45°C (113°F) environments without exceeding the manufacturers specifications. Environment – enclosures with air blowing on them will run cooler, those with a nearby source of radiating heat will run hotter. PC USB Port Loading – running multiple high-wattage USB devices on the NUC can significantly increase heat inside the enclosure. We always recommend that our estimates be treated as only estimates, and that actual operating temperatures of any PC should be checked in the field to ensure that PC manufacturer’s limits are not exceeded.